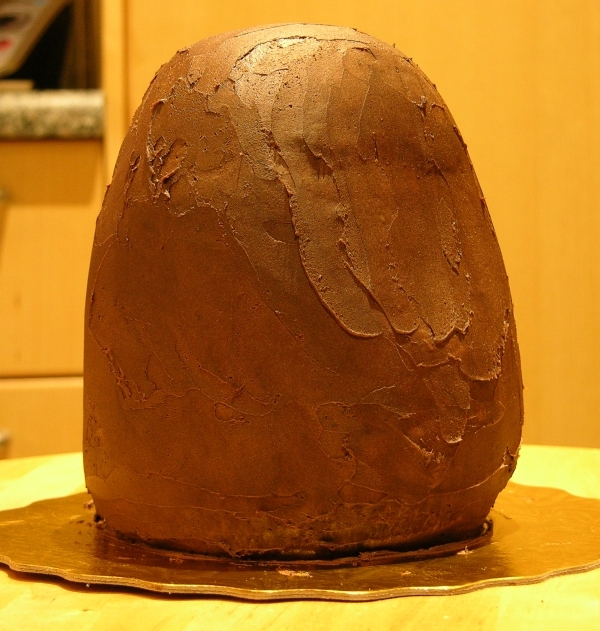 Multiple Layers of Wrong…and Chocolate! 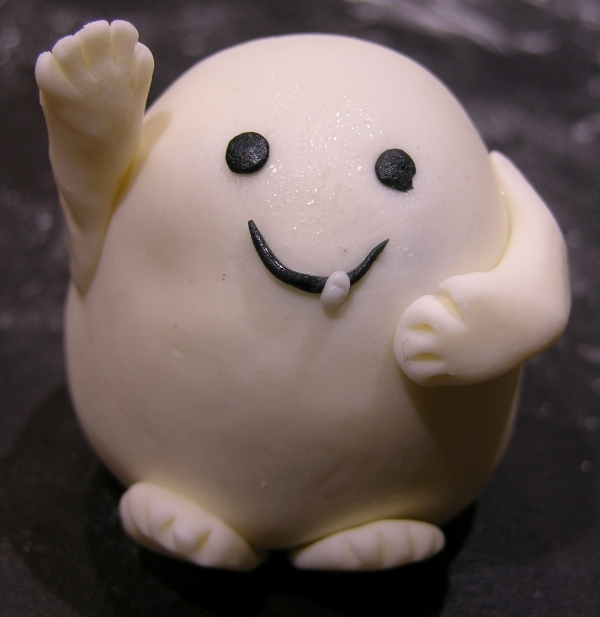 The cutest alien ever on Doctor Who is undoubtedly the Adipose, which are little living lumps of fatty tissue. 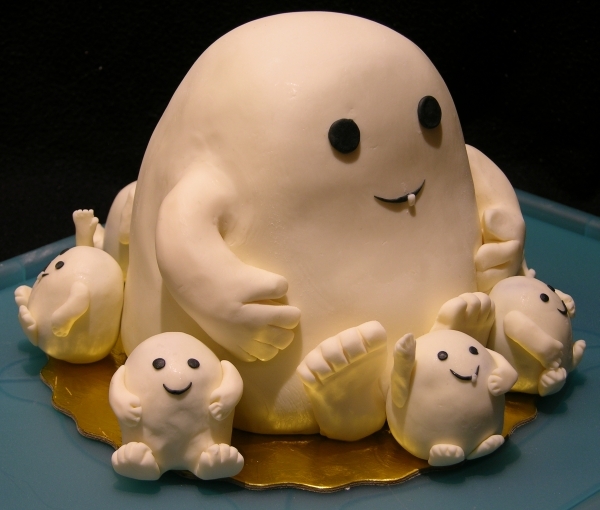 So when I decided to make a cake for my friend Kyla (who is also president of our cake club and known by many as the Cake Nexus because she knows everyone who is anyone in this industry) and was considering a Doctor Who cake since she’s into that, my husband suggested an Adipose cake because it’d be relatively easy, very cute, and horribly, horribly wrong. 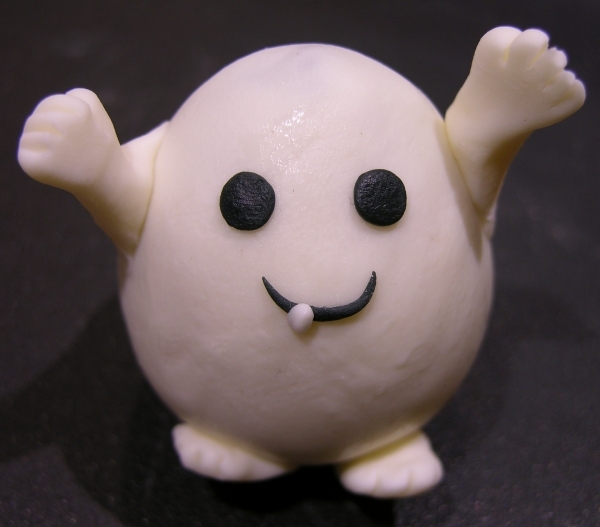 Because this is a monster made out of fat and what happens when you eat cake? You get fat. And then the thought of eating the fat that just left you…yeah, it’s multiple layers of wrong. Except this is also multiple layers of chocolate. 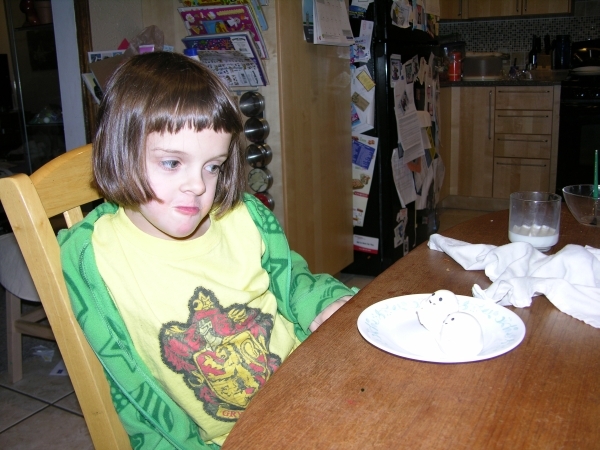 Mmm, chocolate! And wrongness! Together at last! In fact, this was the cake I mentioned in the last post about Dark Chocolate Buttercream, in which I worked out a super-delicious, ultra-decadent, chocolate, butter-based frosting suitable for sculpted cakes and supporting decorative elements. 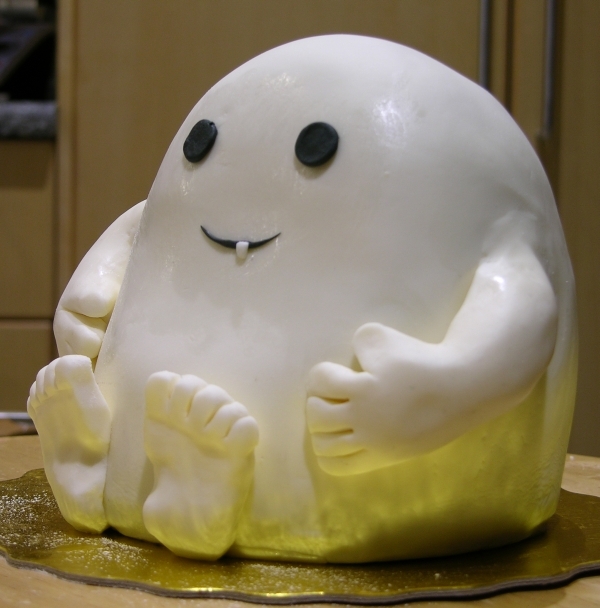 After all, an Adipose cake has to be thickly coated in delicious buttercream, doesn’t it? 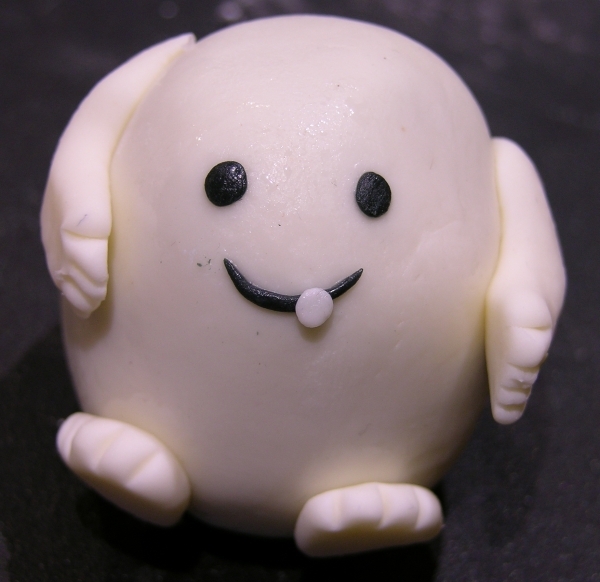 At first I was just going to make a little Adipose guy, but when I had leftover cake and buttercream I decided the cuteness and wrongness could be multiplied further by making cake balls and then turning those into ittle bittle wittle Adiposey cake balls of ULTRA MEGA CUTENESS! 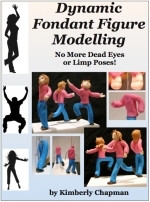 And you lucky readers, I’m going to show you how I made them! First, let’s talk about the main cake itself. I baked a chocolate cake (my standard doctored box mix) in two 5″ pans plus a 4″. I dumped the remaining batter in an 8″ as excess. I levelled, filled, and stacked the 5″ ones and the 4″ on top, then carved an Adipose shape (going roughly off of this plush toy from ThinkGeek, but seated because while I could do it standing, that’d require a floating stand design which would be harder to transport and I wanted this to be fairly easy). I then covered that with the buttercream and let it firm up in the fridge. Activate your scratch-and-sniff peripheral now because damn, this thing smelled like chocolate heaven. Also, I considered it a good sign that it was already kind of cute even without its skin on. I wanted to experiment with a 50/50 modelling chocolate/fondant mix since I couldn’t decide between the two; chocolate tastes better but fondant is easier to put on a shape like this. 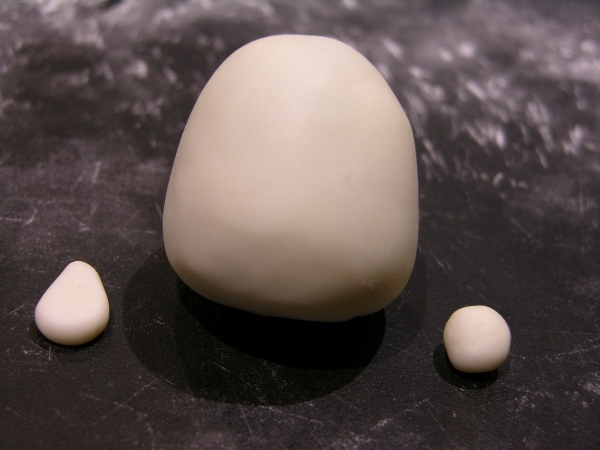 So I weighed out equal portions of each and kneaded them, and given that I was using my homemade fondant which isn’t as smooth as the commercial stuff, I was pleasantly surprised by how flexible and smooth the combination was! Plus it actually tastes good, although still sweeter than my preferences. 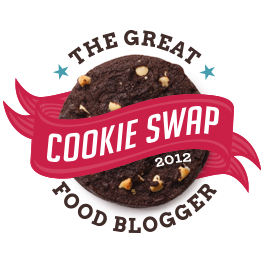 I’ll need to update my recipe pages eventually. The 50/50 wasn’t as good for pulling out pleats, but it did have the benefit of being able to be warmed either by hand heat or a torch, and that let me smooth out seams very nicely. In a reasonably short time I was able to cover the cake plus add feet, arms, and a face. 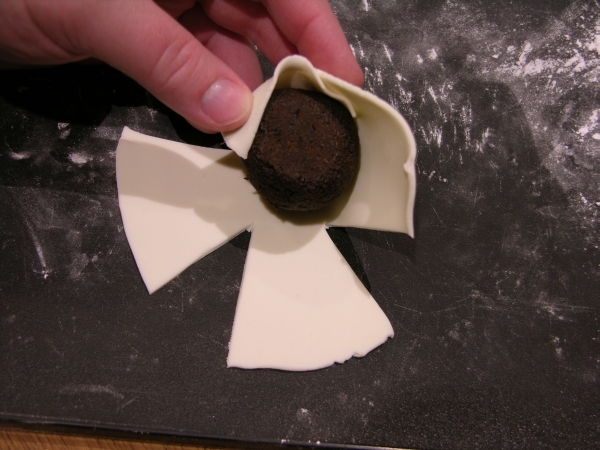 Joining worked just as with modelling chocolate or fondant separately: a bit of moisture to make it sticky and things adhered just fine. Cute on his own, but I had more planned! 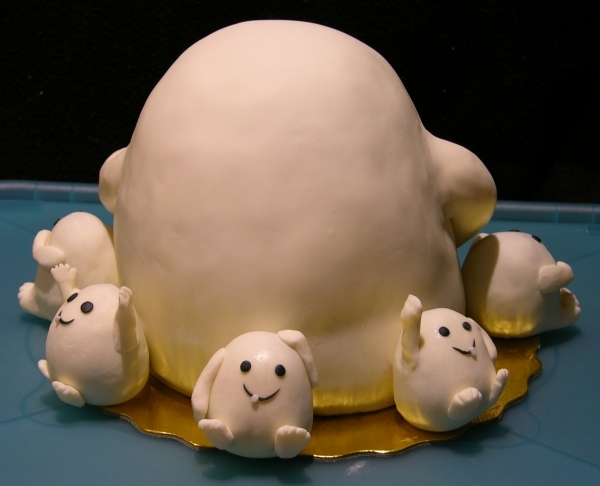 It was getting late, so I combined the cake carvings, the extra 8″ cake, and the leftover buttercream to make cake balls, then formed them into Adipose-like shapes and put them in the fridge to firm up overnight. 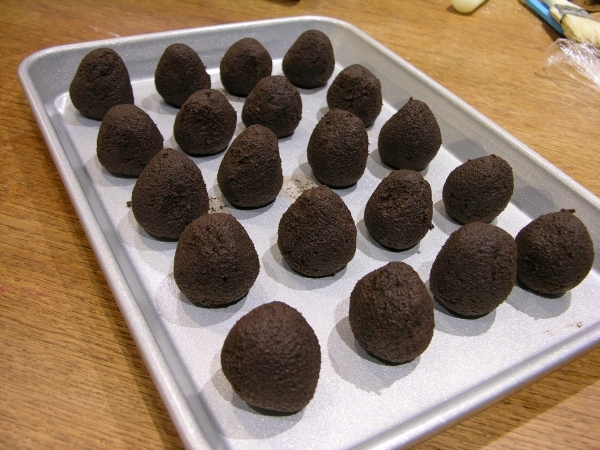 You see chocolate balls, but I see a small army of skinless Adipose. Wheeee! He’s about an inch and a half high. D’awww. This one is a little closer to what I wanted, but still too thick in the covering. Awwww…if this doesn’t make you want to pick him up, you’re made of stone. 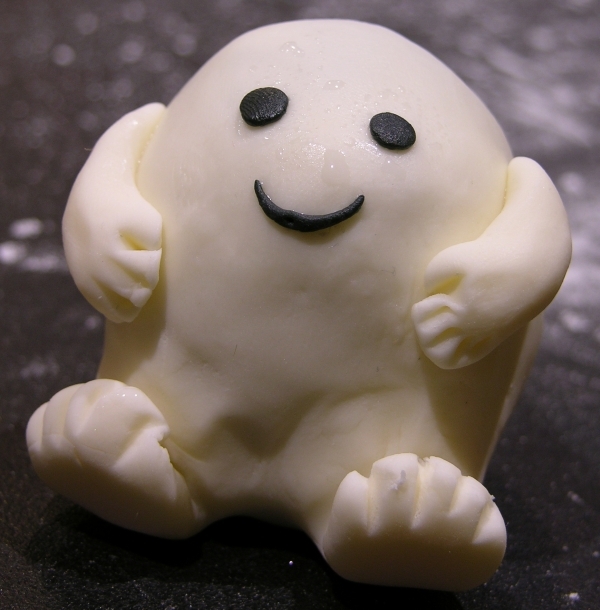 Of course if you pick him up and eat him, you’ll end up made of fat, which then could make more Adipose. It’s the Cirrrrcle of Liiiiife! 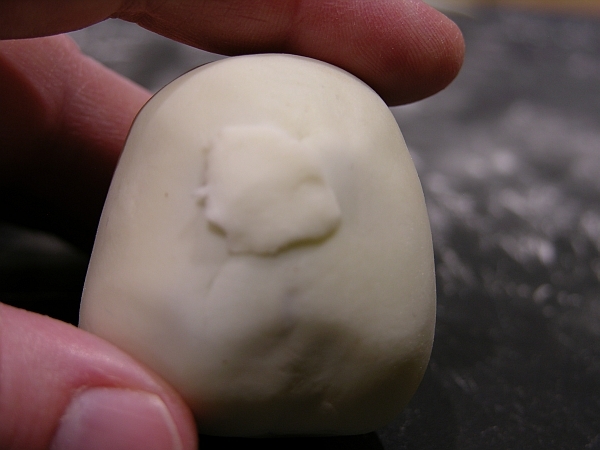 Starting with a ball of 50/50 about the same size as the cake ball, roll it out thin, but not so thin that it gets translucent (or else the chocolate will show through). 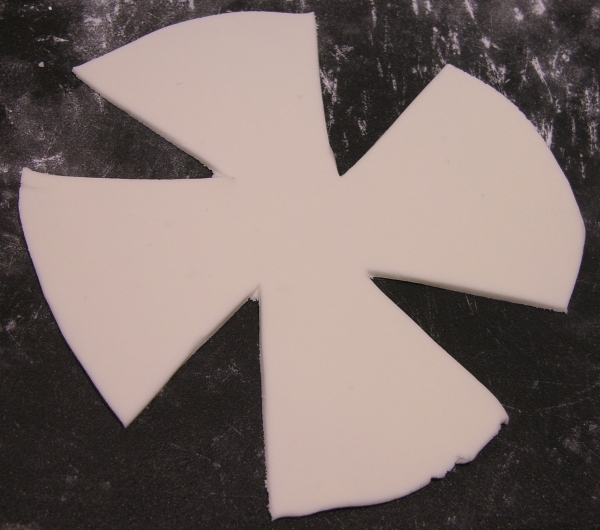 Cut four wedges out as shown. They don’t have to be perfect, but make sure you don’t go to the very center. 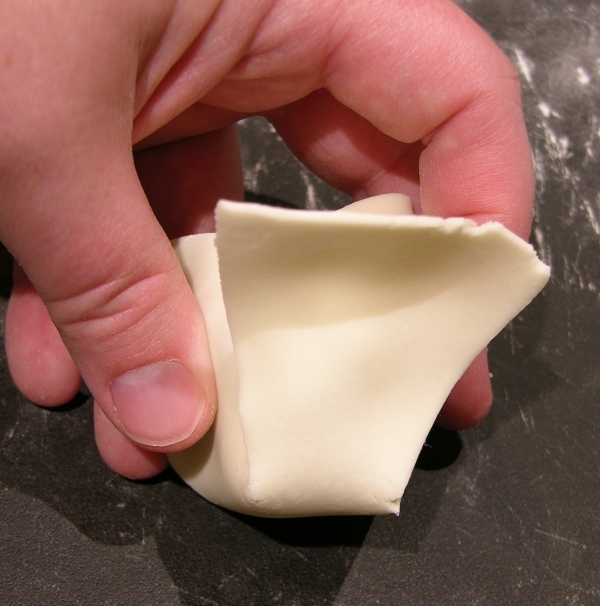 Place the cake ball top down in the middle and fold up one flap, curling it around. Bring up the next flap and let it overlap a little, but push it forward as well as shown. Now bring up the flap from the opposite side (as in, don’t go around in a circle) and likewise let it overlap a little but push it forward. Now fold up that last flap, but you should barely need it; there should be almost enough from the side flaps to cover the whole thing. If there is any excess (which is likely), tear it off. Don’t worry about formality. Just make sure you’re not ending up with a huge gob of 50/50 at the bottom. That should cover the sides completely. It will be lumpy and uneven where it overlaps, but don’t worry about that for now. Turn it over and pinch the flaps out over the bottom to cover it. 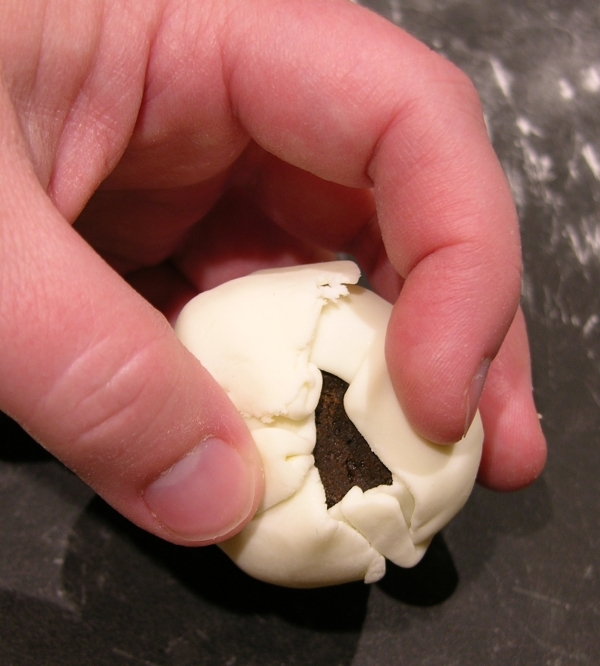 Be sure not to drag the 50/50 along the cake ball or you’ll get brown bits mixed up into it. 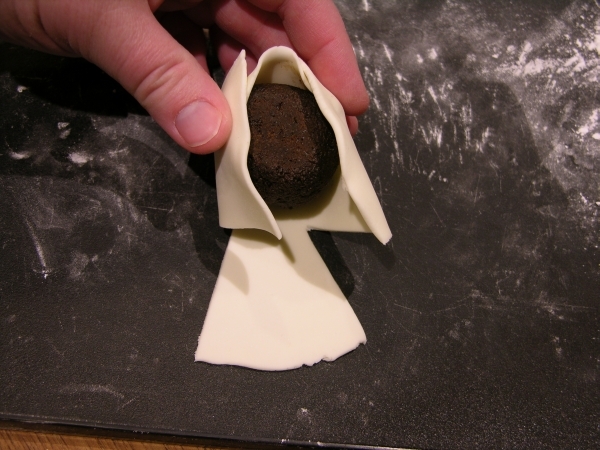 Once it’s all covered, you can use the softening quality of the modelling chocolate in the 50/50 to smooth everything out. 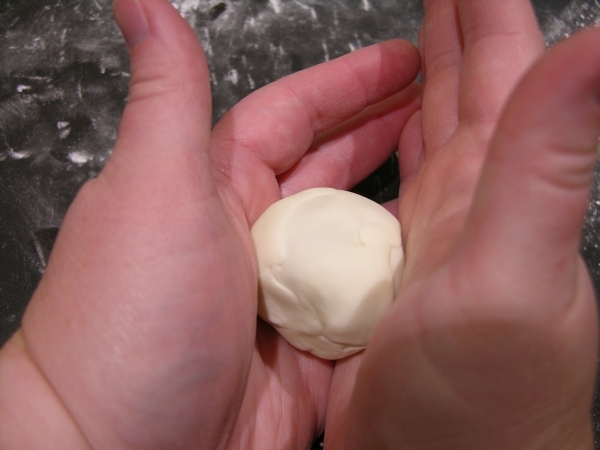 With warm hands (rub yours together if they’re cold), roll the ball gently but firmly to stick it all down evenly. Also roll it along your smooth work surface to help push extra material around into an even coating. You will likely have to go back and forth between this and the previous step a few times until it’s to your satisfaction all over. Don’t worry if a pleat line remains on the bottom since you’ll be sitting it down anyway (unless you’re not going to have it seated, of course). Hopefully your covering went on well, but if you do get a thin spot where the chocolate cake is showing through, don’t panic, and don’t try to pinch from the sides since that just mixes the chocolate into the 50/50 even more. Instead, add a little flattened piece of 50/50 over the offending mark. 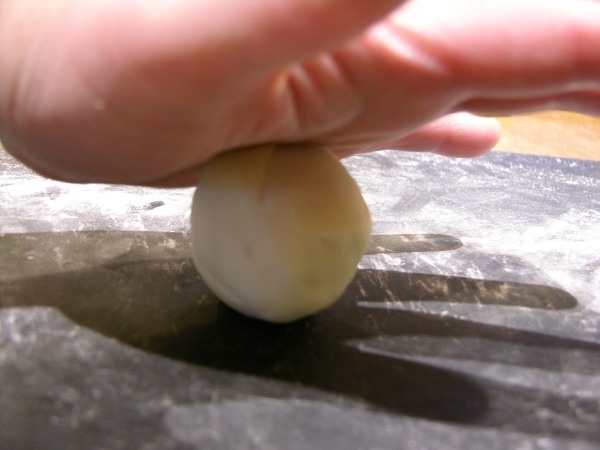 Then gently blend that in with your warm hand and with rolling on the work surface as above. If it’s not perfect, don’t worry: just use the other side for the face. 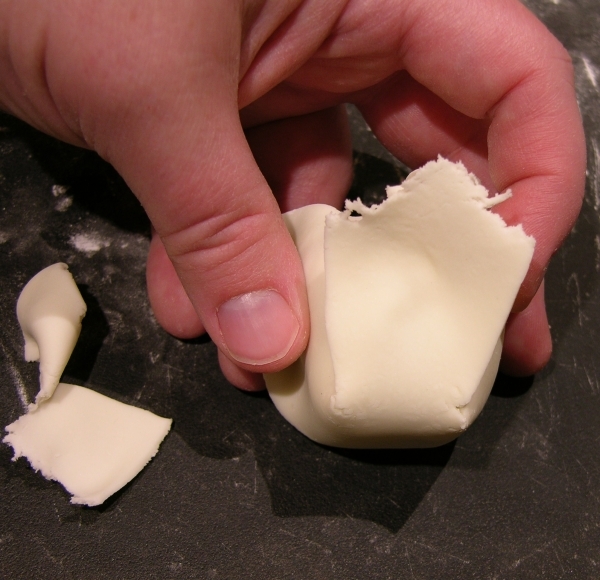 Once you’ve got a smooth side you’re happy with, turn it to that side up and press the whole thing down a little to make a flat surface for its bottom. 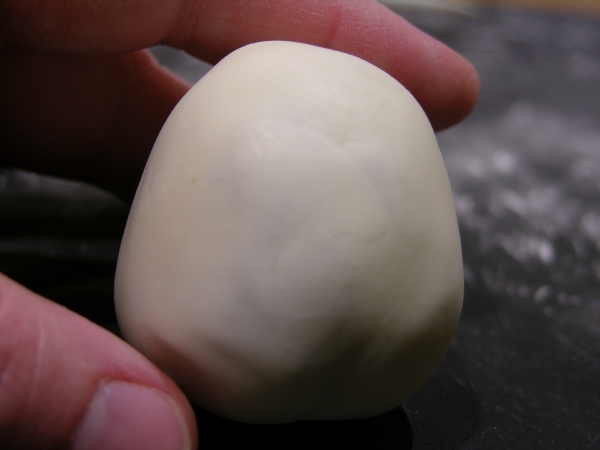 For the feet, make two equal sized balls, then form into a tear drop and affix to the bottom edge with a bit of water. 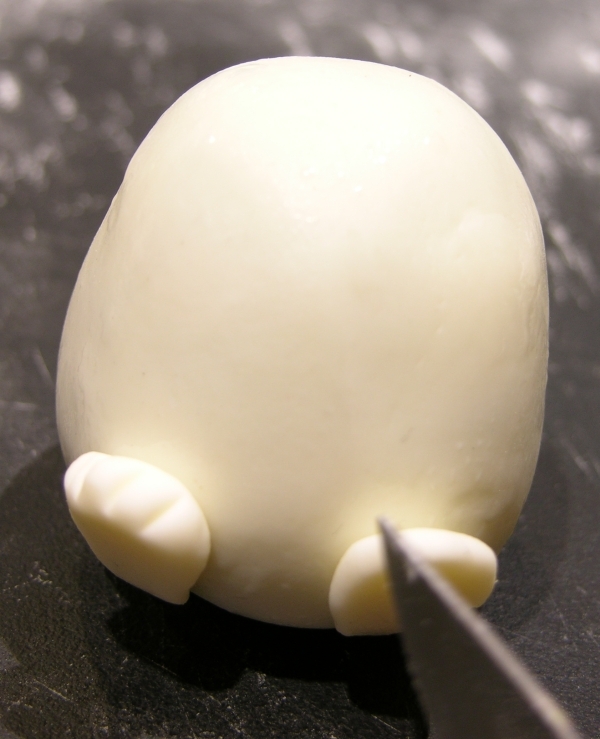 Use a sharp knife to make toe indentations very gently. 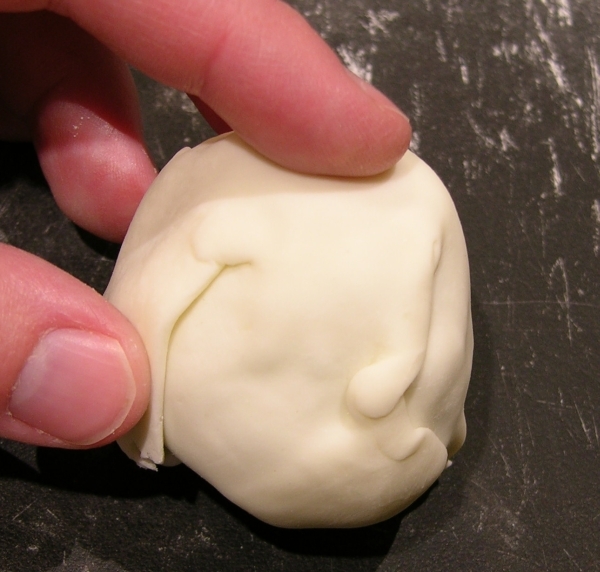 Roll a small sausage and cut it half on an angle to form shoulders and arms. Lightly flatten out the hand ends. Again, use a sharp knife to make finger indentations. 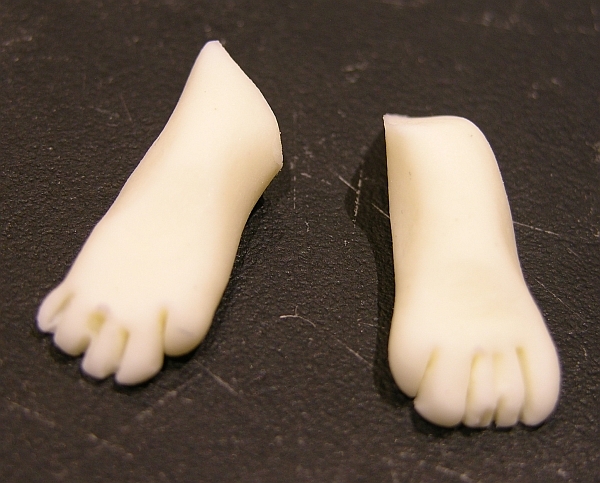 For better-formed hands, see my Fondant Figure 101 tutorial. Attach the arms with a bit of water. 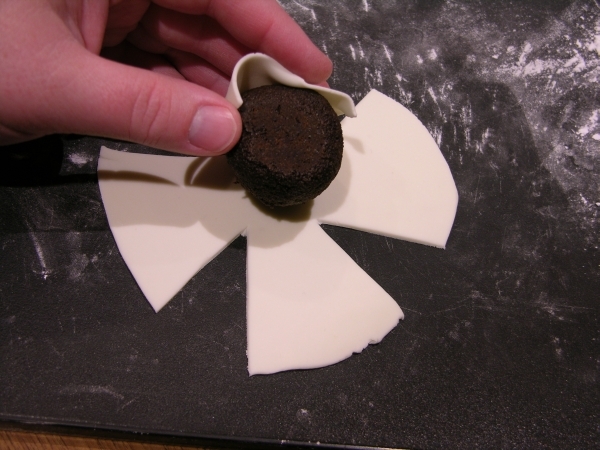 Make two tiny balls of black 50/50 (or fondant, or modelling chocolate) and stick them on with a bit of water. Roll a super-tiny thin snake, making sure the ends taper off, and put it in place as the smile. Note that 50/50 will melt on a warm fingertip at this scale, so you may need to use a fine tool to help you place these items. If desired, add a tooth. I noticed a lot of toys/figurines have the tooth there, but in doing several I liked to have some with a tooth and some without. So there you have it! 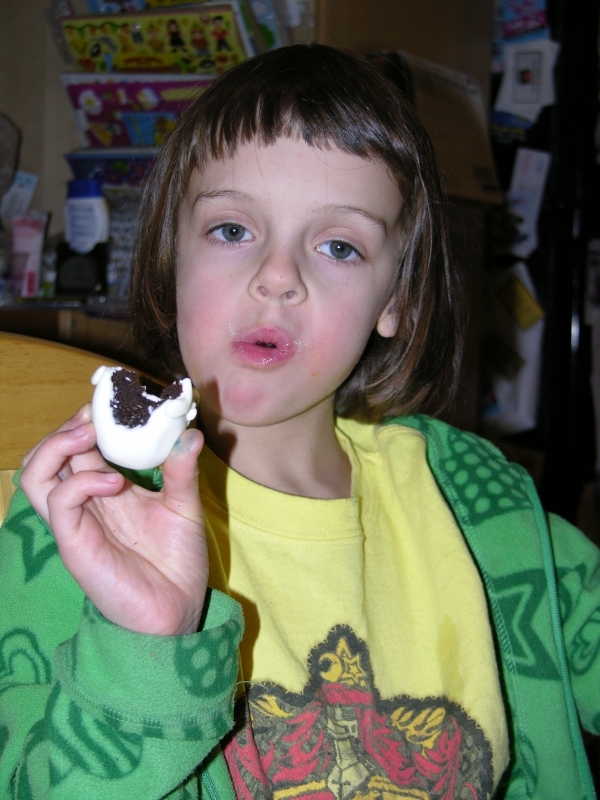 The 50/50 does a nice job of blending with itself to cover a cakeball, and it tastes good on there too. I definitely recommend it. 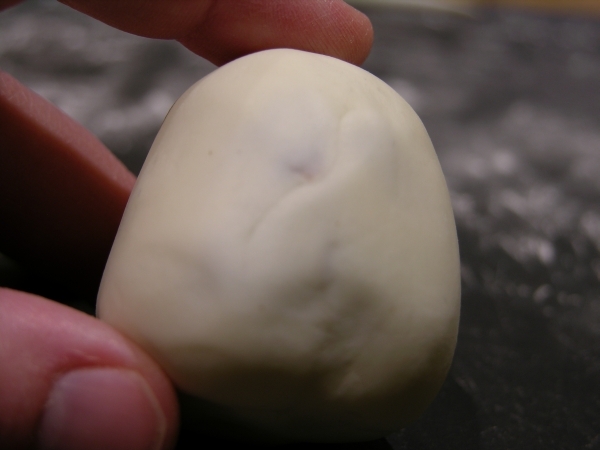 It won’t be as hard as coating a cake ball with melted chocolate of course, but it grants you more sculpting potential. 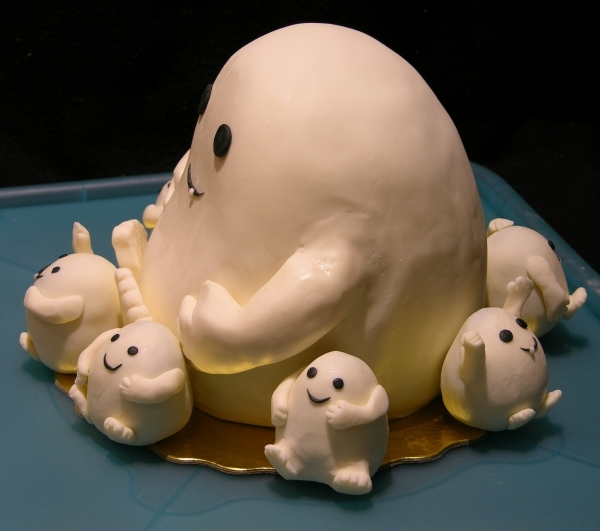 Next, I simply put the mini Adiposes all around the big one, wetting them a little on their bottoms and backs to stick them to the cake board and the big Adipose. Then it was done! There’s the “pick me up!” one. Squee! Remember, decorators: there should never be a complete “back side” to a cake. 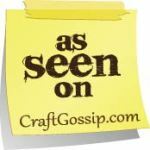 Make sure there’s something of interest to see from every view, even if it’s small. 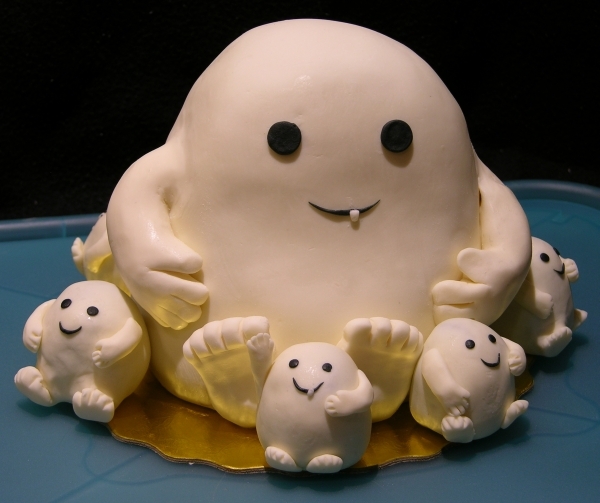 Adipose Cake: the cake that eats you back after you eat it. Of course, it doesn’t end there. First of all, I have a seven year old and while she doesn’t watch Doctor Who (no matter how much she begs or tells me kids at school do, because it’s not child-appropriate), I couldn’t really hide this much cuteness from her. 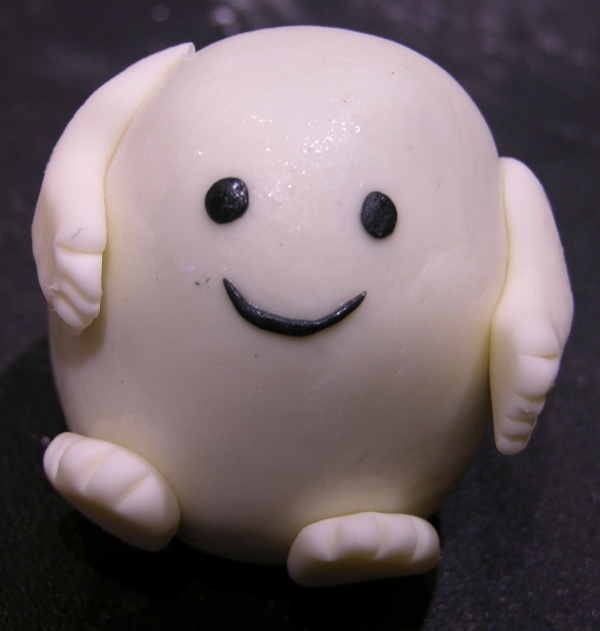 So I gave her a sanitized version of the Adipose story and made a couple of extra Adipose cake balls for her to eat. She insisted on a photo of her posing as if she’s regarding them dubiously, instead of how she’d been actually staring at them longingly all through the dinner I made her eat first on account of being the meanest mom ever. And that dinner was leftover pizza. OH THE CRUELTY. Then we took the cake in my big carrier to a Capital Confetioners Club meeting to give it to Kyla. It sat like this on the table across from Kyla for the whole meeting and she didn’t even notice it. Hah! Finally, when Kyla tried to pick someone else from the club for this month’s Member Spotlight, I stood up and declared that she was in the spotlight because it was her birthday and this was her birthday cake. 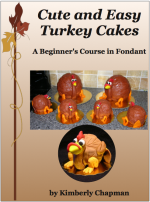 So she told us all about how she got started in cake decorating. I had a photo of her with it but she didn’t like the pic so I’ve removed it. 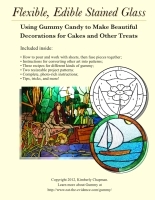 This entry was posted in Cake Decorating, Cupcakes and Mini Cakes, Experimental Techniques, Fancy cakes, General Freakishness, Severe Nerdery. Bookmark the permalink. 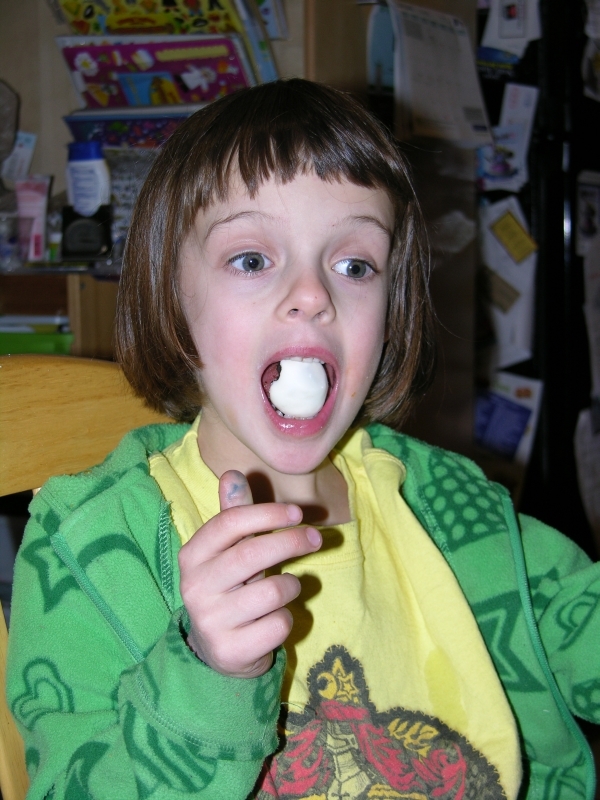 7 Responses to Multiple Layers of Wrong…and Chocolate! Are these things edible?? The look quite tasty. whenever a comment is added I recieve four emails with the exact same comment. Sorry, I have no control over that. You'll have to find the subscription to the thread within your Intense Debate settings and turn it off there. Man these look yummy in a big way.